North East Memorials is a family owned and operated monumental stone masonry business based in Albury, New South Wales & Myrtleford, Victoria. 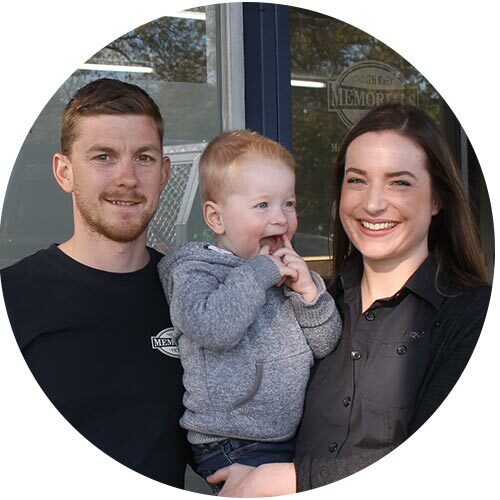 With over 40 years of family experience, North East Memorials is an Australian owned and operated business, managed by Damien and his family Rebecca & Max. North East Memorials deliver on professionalism and trademanship in creating everlasting memories for you and your loved ones. Our staff consists of family and friends, therefor we know we can offer reliability in supplying you with our products and services. We supply and install all styles of monuments and memorials including traditional, modern, natural and custom styled headstones and memorials using Australian and imported natural stone. We travel all over the state building war memorials, private monuments and completing restorations and repairs. This in return, gives us the capacity to offer our services across the entire state. Our staff are expertly trained and in a variety of areas to provide you with the best overall service. We cater for all budgets, and provide you with a caring and professional service. We understand it can be a financially difficult time, and we want you to know that we will work with you to create an everlasting memorial that you will forever be proud of. For further details on the locations that we services, contact us for more information.